Not in my corporate workspace! It was always bound to happen, wasn't it? The computers, in their infinite efficient glory, were always going to replace us puny mortals in the workforce. 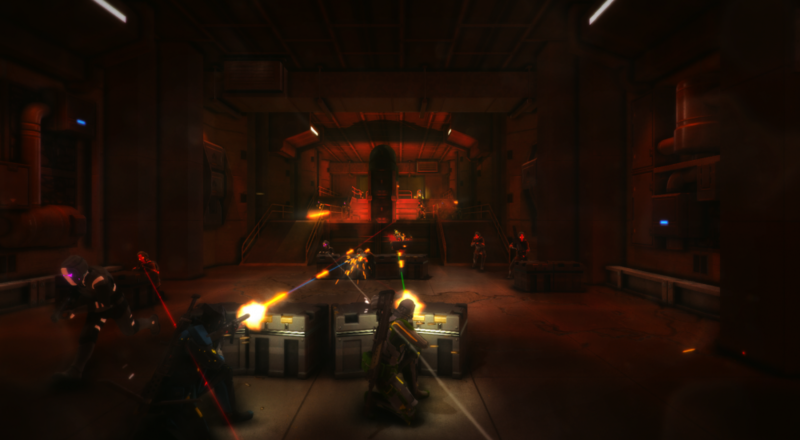 The upcoming four player co-op game, Hollowpoint, just moved the timeline forward a few years. To me, some of the quickest folks to get replaced will be the nerds, the guys and gals who spend their days toiling away on Excel sheets and the like. I like to imagine a dystopian future where legions of unemployed geeks roam the streets, looting comic book stores and stopping only to host weekly Warhammer 40k tournaments. I would be among their number, of course, probably leading a horde to the tune of Decemberists songs. In Hollowpoint's future, players take on the role of corporate mercenaries, cyber-ninjas working for the highest bidder. As far as gameplay goes, it appears to be a mix of side-scrolling action and cover based shooting. The apocalyptic enthusiasts at Ruffian Games purport to bring 2D action to the modern era, which I am 100% down with. We may find a bit more info on the game at E3, which is upon us is a terrifyingly short amount of time. Paradox Interactive has a pretty good track record as a publisher of co-op games, so I'm excited to see what Hollowpoint can bring to the table. It'll be out on PS4 and PC sometime later this year, and you'll be the first to know when we find out the exact date. Page created in 0.8182 seconds.